Florida continues to grow as an economic powerhouse, surpassing New York as the nation’s third most populous state. With unemployment continuing to decline and business expansions in Tampa Bay, business confidence was up, leading to an increase in all types of real estate activity. In particular, Tampa Bay’s industrial market saw activity from users and investors. Leasing saw less activity due to limited quality properties available. Demand for product prompted Landlords to pull the trigger and begin building and/or placing properties on the market. 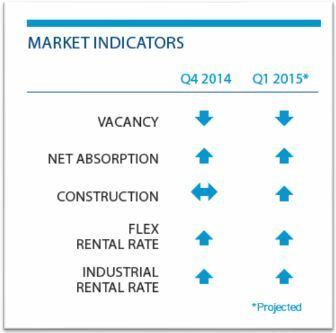 Confidence in the market will position 2015 to be a good year for industrial real estate. In Tampa Bay’s largest industrial sale MDH Partners, LLC, purchased a 191,158 square foot industrial building, located at 2000 N 62nd Street in Tampa, from ABK Real Estate, LLC, for $8,011,450. A 40,704 square foot industrial building located at 1307 E 2nd Ave. in Ybor City sold for $6 million. Trs Properties, Inc. sold the property to Tampa Electric Co. for $147.41 per square foot. Sims Recycling Systems signed a 205,000 square foot lease renewal and expansion in the Hanna Distribution Center at 5806 N 53rd Street in Tampa. Overall, a net of more than 683,000 square feet were absorbed in Tampa Bay’s industrial market and the total vacancy dipped to 8.6%. 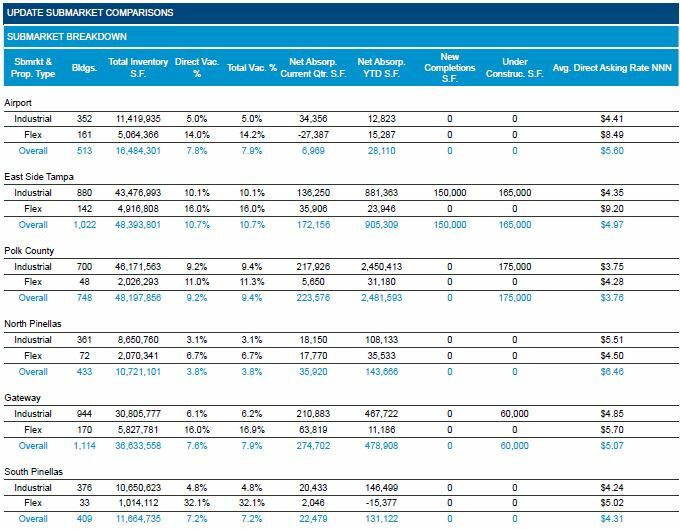 The most absorption was in the Gateway submarket with 274,704 square feet absorbed. Due to limited availability in the Airport submarket only 6,969 square feet was absorbed. Ruskin and Lakeland experienced the “Amazon effect,” with companies establishing operations near the new Amazon distribution centers in those areas, including pallet, transport and maintenance businesses. With the resurgence of the housing market, Tampa Bay’s industrial market saw increased activity among construction, building supply, lumber and moving companies. Industrial spaces in the 20,000 to 30,000 square foot size were in demand by users either for lease or for purchase. Lakeland saw activity from tenants looking for 5,000 to 25,000 square feet of industrial space. As the economy continued to improve, businesses sought space to expand or for new locations. There was an increase in leasing activity in the flex market. Contractors and Engineering firms were active in leasing flex space for 2,000 to 12,000 square feet. Similarly, small industrial tenants in Pinellas County were active. Overall, rental rates held steady from the third quarter at $4.28 per square foot. 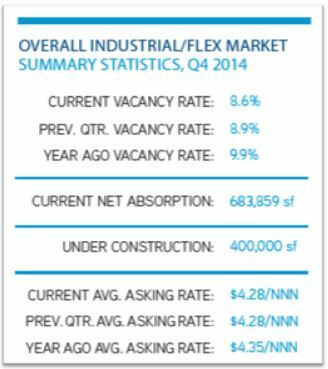 The average asking rental rate for flex space increased slightly to $7.62. Concessions remained consistent with the previous quarter. Landlords offered minimal or no free rent depending on the term and the credit of the tenant. Tenant improvement allowances were approximately 50 cents per square foot for existing space. When competing for national tenants Florida still lags in comparison to other southeastern states. Some large deals have gone out-of-state due to Florida’s inability to compete with the product, rates and government incentives being offered elsewhere. Following a growing trend of sale-leaseback transactions, Brennan Investment Group, LLC purchased the 113,308 square foot industrial property at 5120 Great Oak Drive in Lakeland for $5.3 million from Great Oak Property Management, LLC, who operates as Structall Building Systems. Construction of new facilities is underway. Cabot Crosstown, a 150,000 square foot Class A distribution warehouse was completed. In the Gateway submarket, construction commenced at 12200 Belcher Road, for a 60,000 square foot Class B warehouse. East Group has two buildings in process at Madison Distribution Center; 59,000 square foot and 68,000 square foot distribution facilities with some preleasing; these will deliver this quarter. In Lakeland, Aspyre Properties is projected to tilt the wall panels at Interstate Commerce Park on their 175,000 square foot spec building this quarter as well.